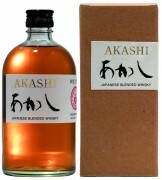 A fantastically smooth blended Japanese whisky. Hibiki whiskies include malt whisky from the Yamazaki and Hakushu Distilleries as well as grain whisky from The Chita grain distillery. The whiskies are drawn from 5 different types of cask, including American white oak casks, Sherry casks and Mizunara oak casks. Hibiki is Japans most awarded blended whisky. Amber in colour with notes of sandal wood, rosemary, rose and lychee on the nose. The palate has a honey like sweetness to it with a hint of candied orange peel and spice. The finish is subtle yet long with the spices taking over from the fruit. Produced by Suntory, Japan.